British Literature in Transition maps a century of change. It also seeks to change the way we think about British literary history by reconsidering the canonical certainties and critical norms that shape our understanding of twentieth-century writing. Breaking down the century into twenty-year blocks, each substantial volume surveys, interrogates and challenges prevailing assumptions of critical memory to create a vibrant picture of literary culture in its time. Importantly, this revisionary series both recognises the contingency of the 'experimental' and argues that long-established canons do not do justice to the many and various forms that innovation took across the breadth of the twentieth century. 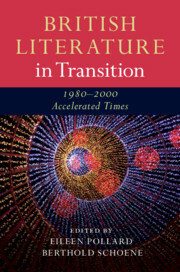 As a result, Transitions reinstates lost complexities and reanimates neglected debates, its authoritative new essays setting familiar figures alongside forgotten voices to generate a rich and provocative picture of a transformative century. Exploring transitions in writing, performance, publication and readership from the fin de siècle to the new millennium, the series offers new routes to an understanding of how British literature arrived in the twenty-first century and what made the nation's writing what it is today.